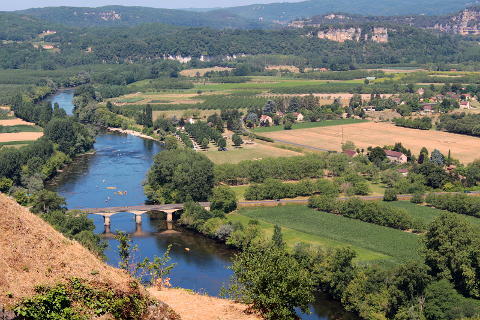 The Valley of the Dordogne is the name given to the part of the river that falls within the Correze department, heading upstream along the Dordogne river from Beaulieu-sur-Dordogne (south-west) to the Barrage de Sablier, Barrage de Chastang and on past these dams to Bassignac. Hence it is on the river Dordogne but is not in the Dordogne department - it falls within the southern Correze department. Click here for places in the Dordogne department. The Valley of the Dordogne developed because of the importance of the river as a transport route and trade originally developed around the wood and leather industries. The landscape consists of steep wooded hills climbing up both sides of the river valley, with small picturesque villages both in the valley itself (eg Brivezac and Saulieres) and also nestling deep in the ‘side valleys’ (eg Neuville and Albussac). The countrsyide is largely unspoiled and there are many traditional houses and smallholdings to admire as you explore. The central towns for exploring the Valley of the Dordogne are Argentat and Beaulieu-sur-Dordogne, both attractive small towns offering all facilities and numerous leisure opportunities, and each with tourist offices to give you lots of useful information. 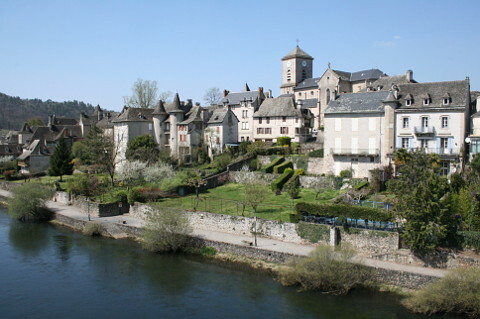 Be sure to spend time in both towns - especially don’t miss the quai area in Argentat, a very picturesque stretch of river with several cafes where you can sit and enjoy the view across the river, enjoy the sunshine and relax in peace, and the old town in Beaulieu-sur-Dordogne. It is a very scenic area, most suited to those who enjoy outdoor activities - walking, cycling (road and mountain biking), horse-riding, canoeing and fishing are the most popular and many other options are available - the adventurous might enjoy hang-gliding. Gabare (boat) trips are also available on the Dordogne river here. If you want to base yourself in the Dordogne department which is somewhat livlier than the Dordogne Valley in the Correze then Sarlat is nearby and is a beautiful town or you could consider Souillac if you want something less busy.